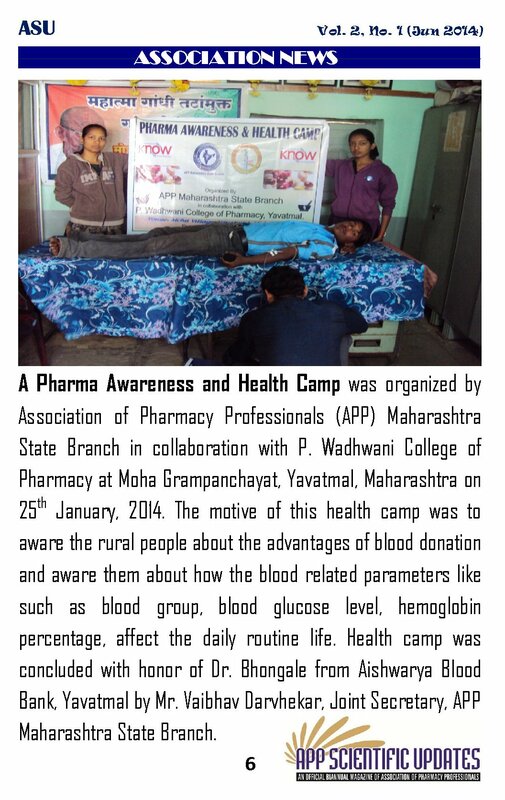 Association of Pharmacy Professionals (APP) Maharashtra State Branch organized a ‘Pharma Awareness and Health Camp‘ in collaboration with P. Wadhwani College of Pharmacy at Moha Grampanchayat, Yavatmal, Maharashtra on 25th January, 2014. 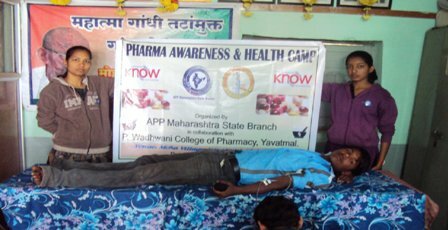 The motive of this health camp was to aware the rural people about the advantages of blood donation and aware them about how the blood related parameters like such as blood group, blood glucose level, hemoglobin percentage, affect the daily routine life. 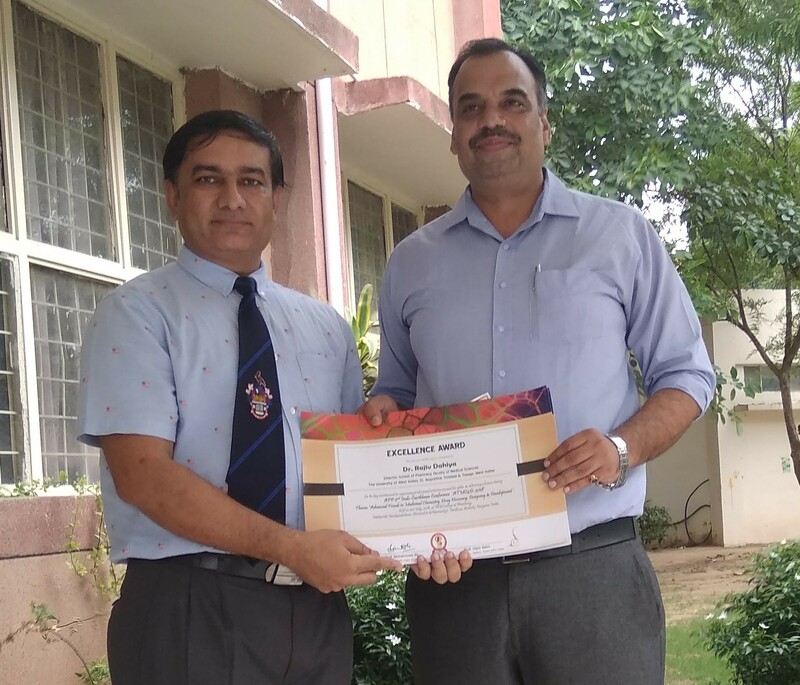 Health camp was concluded with honor of Dr. Bhongale from Aishwarya Blood Bank, Yavatmal by Mr. Vaibhav Darvhekar, Joint Secretary, APP Maharashtra State Branch. 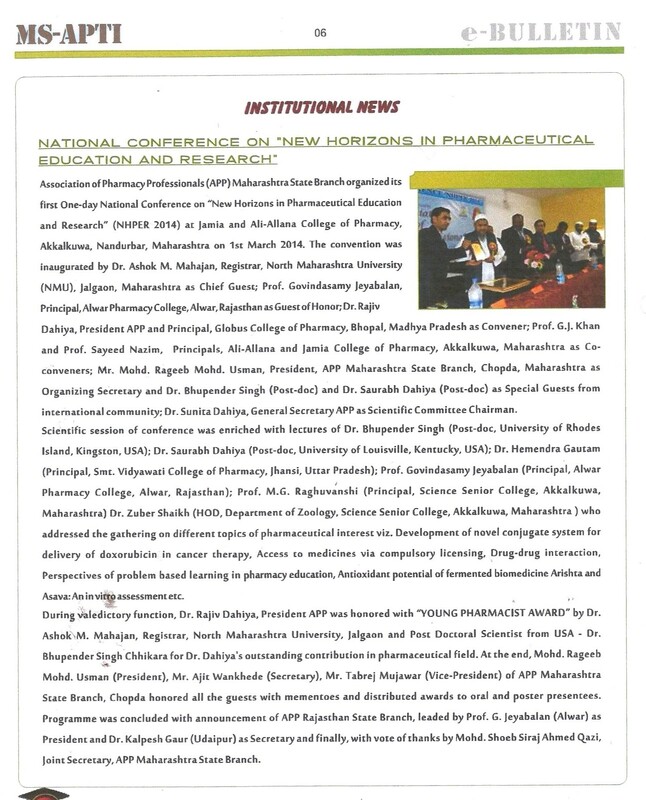 Association of Pharmacy Professionals (APP) Maharashtra State Branch organized a One-day National Conference on “New Horizons in Pharmaceutical Education and Research” (NHPER 2014) at Jamia and Ali-Allana College of Pharmacy, Akkalkuwa, Nandurbar, Maharashtra on 1st March 2014. 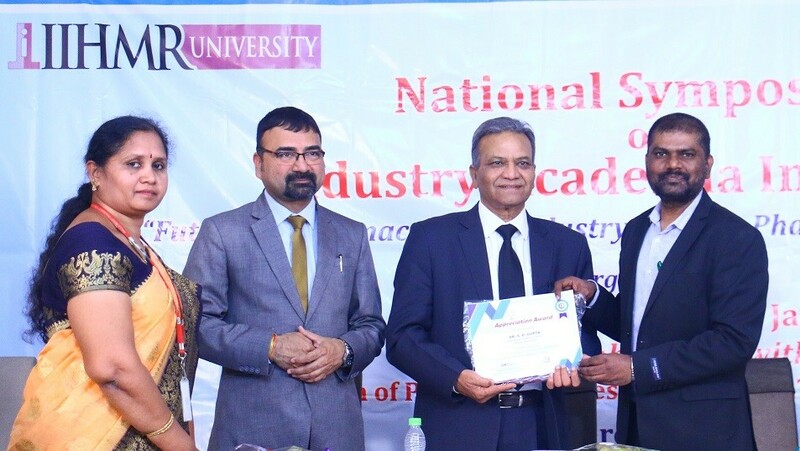 The event was inaugurated by Dr. Ashok M. Mahajan, Registrar, North Maharashtra University (NMU), Jalgaon, Maharashtra as Chief Guest; Prof. Govindasamy Jeyabalan, Principal, Alwar Pharmacy College, Alwar, Rajasthan as Guest of Honor; Dr. Rajiv Dahiya, President APP and Principal, Globus College of Pharmacy, Bhopal, Madhya Pradesh as Convener; Prof. G.J. 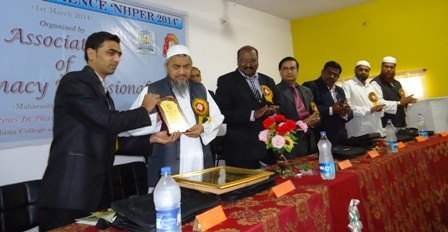 Khan and Prof. Sayeed Nazim, Principals, Ali-Allana and Jamia College of Pharmacy, Akkalkuwa, Maharashtra as Co-conveners; Mr. Mohd. 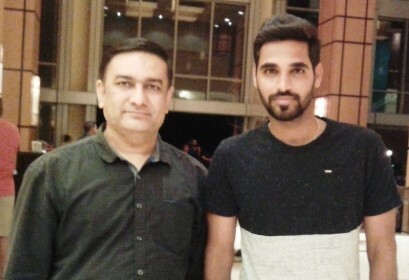 Rageeb Mohd. 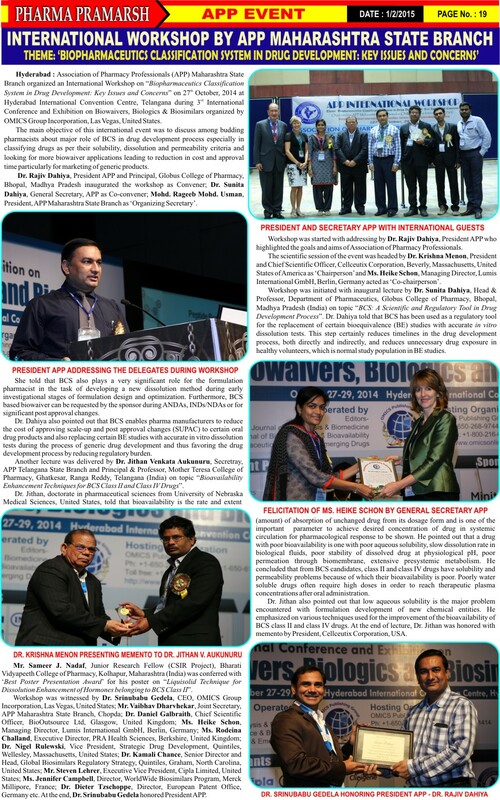 Usman, President, APP Maharashtra State Branch as Organizing Secretary and Dr. Bhupender Singh and Dr. Saurabh Dahiya as Special Guests from international community; Dr. Sunita Dahiya, Secretary APP as Chairman – Scientific Committee. 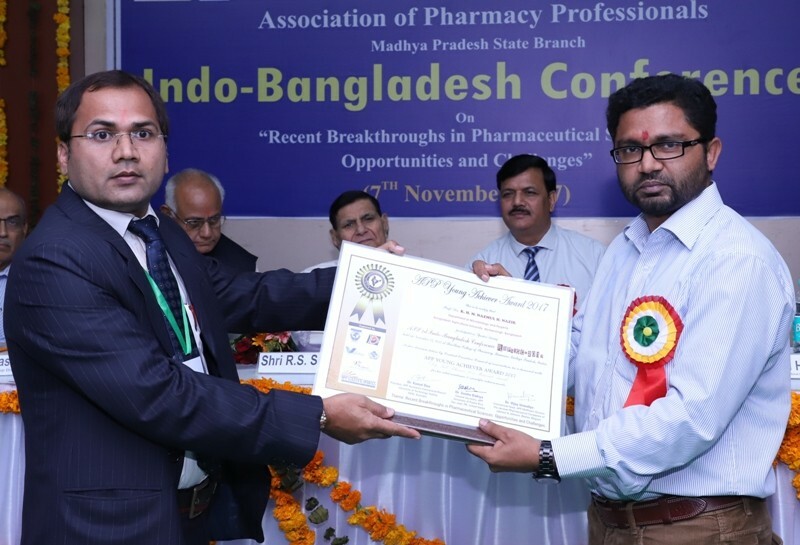 Scientific session of conference was enriched with lectures of Dr. Bhupender Singh (Post-doc, University of Rhodes Island, Kingston, USA); Dr. Saurabh Dahiya (Post-doc, University of Louisville, Kentucky, USA); Dr. Hemendra Gautam (Principal, Smt. 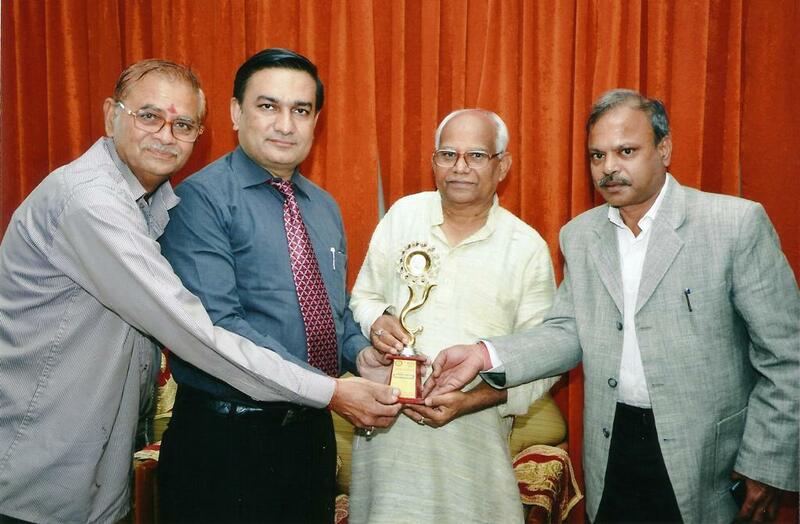 Vidyawati College of Pharmacy, Jhansi, Uttar Pradesh); Prof. Govindasamy Jeyabalan (Principal, Alwar Pharmacy College, Alwar, Rajasthan); Prof. M.G. 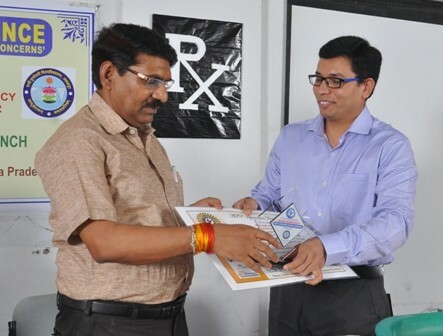 Raghuvanshi (Principal, Science Senior College, Akkalkuwa, Maharashtra) who addressed the gathering on different topics of pharmaceutical interest viz. 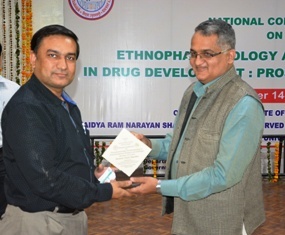 ‘Development of novel conjugate system for delivery of doxorubicin in cancer therapy’, ‘Access to medicines via compulsory licensing’, ‘Drug-drug interaction’, ‘Perspectives of problem based learning in pharmacy education’, ‘Antioxidant potential of fermented biomedicine Arishta and Asava: An in vitro assessment’ etc. 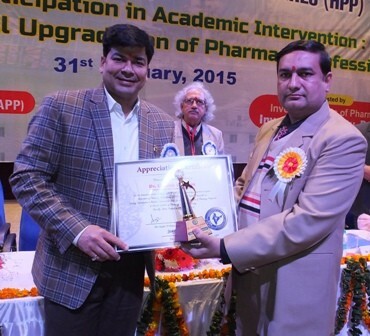 During valedictory function, Dr. Rajiv Dahiya, President APP was honored with “YOUNG PHARMACIST AWARD” by Dr. Ashok M. Mahajan, Registrar, North Maharashtra University, Jalgaon and Post Doctoral Scientist from USA – Dr. Bhupender Singh Chhikara for Dr. Dahiya’s outstanding contribution in pharmaceutical field. 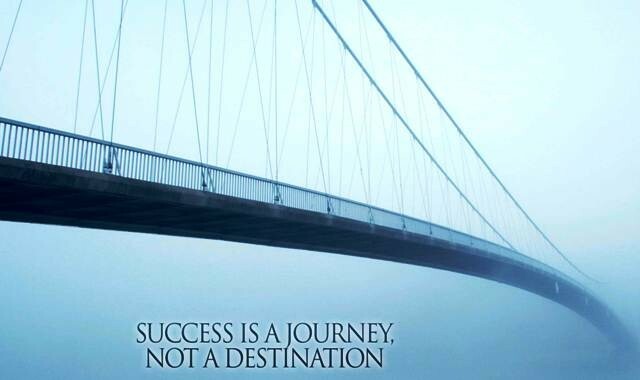 At the end, Mohd. 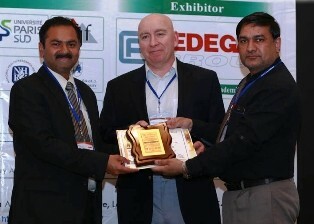 Rageeb Mohd. 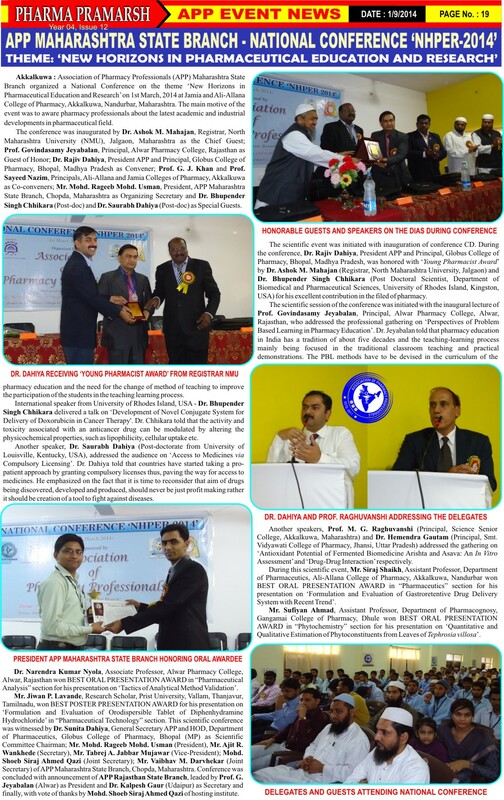 Usman (President), Mr. Ajit Wankhede (Secretary), Mr. Tabrej Mujawar (Vice-President) of APP Maharashtra State Branch, Chopda honored all the guests with mementoes and distributed awards to oral and poster presentees. 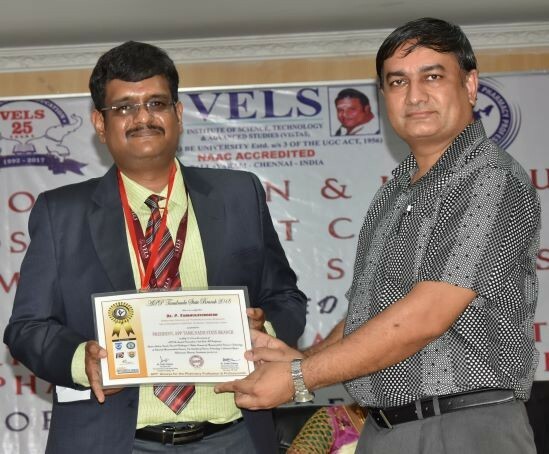 Programme was concluded with announcement of APP Rajasthan State Branch, leaded by Prof. G. Jeyabalan (Alwar) as President and Dr. Kalpesh Gaur (Udaipur) as Secretary and finally, with vote of thanks by Mohd. 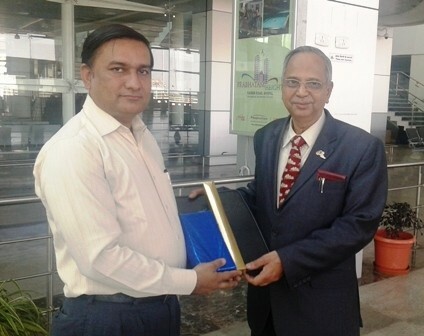 Shoeb Siraj Ahmed Qazi, Joint Secretary, APP Maharashtra State Branch. 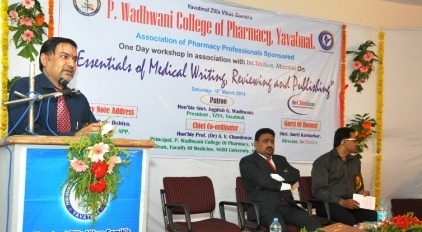 Association of Pharmacy Professionals (APP) Maharashtra State Branch organized a One-day Workshop on “Essentials of Medical Writing, Reviewing and Publishing“ on 15th March, 2014 at P. Wadhwani College of Pharmacy, Yavatmal, Maharashtra, in collaboration with InClinition, Mumbai. 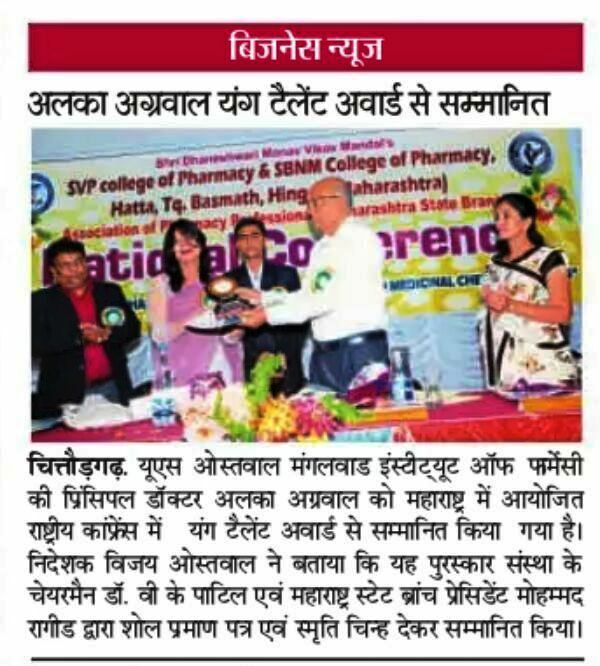 The workshop was sponsored by Association of Pharmacy Professionals and inaugurated by Dr. Rajiv Dahiya, President APP and Principal, Globus College of Pharmacy, Bhopal, Madhya Pradesh as Chief Guest; Mr. Vikram Karmarkar, Director, InClinition, Mumbai as Guest of Honour; Dr. A. V. Chandewar, Principal, P. Wadhwani College of Pharmacy, Yavatmal as Chief Coordinator; Mr. Vaibhav Darvhekar, Joint Secretary, APP Maharashtra State branch as Organizing Secretary. 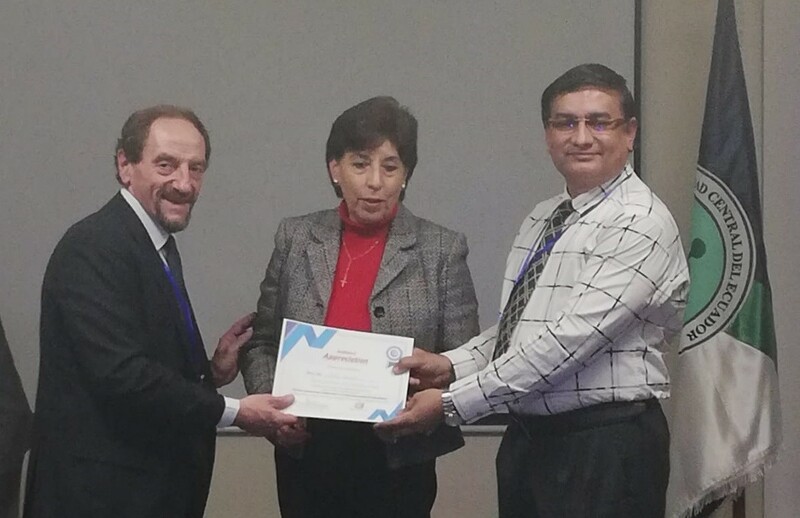 During workshop, President APP and Director, InClinition focussed on the objectives of the workshop like good publication practices, international documentation standards, use of softwares in medical research, writing clinical study reports for clinical trials with focus on ICH E3 guidelines, writing grant proposals, CTD documents, publishing pharmaceutical and medical research and evaluation of authors impact assessment etc. 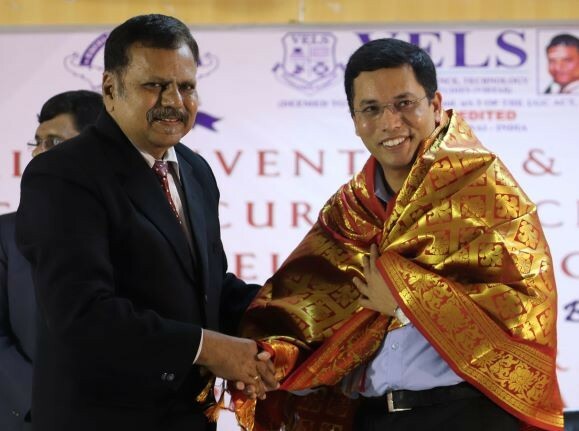 Workshop was concluded with presenting mementoes and shawls to Dr. Rajiv Dahiya, Mr. Vikram Karmarkar and President, APP Maharashtra State branch by Prof. A. V. Chandewar, Principal of hosting institute. 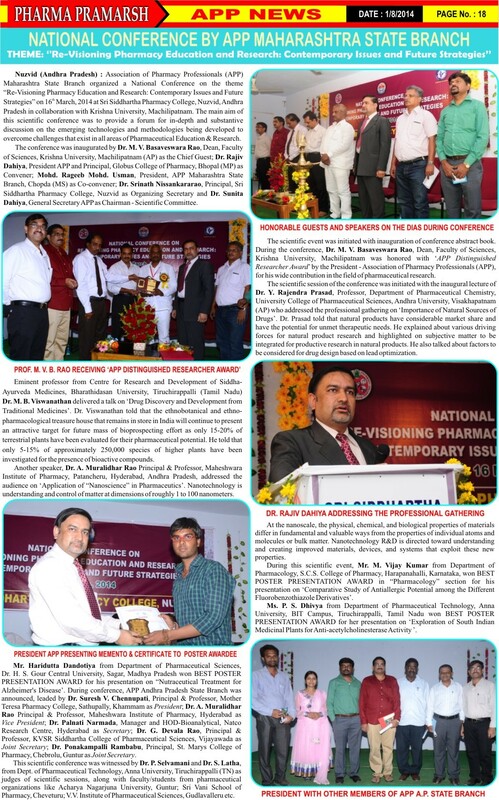 APP Maharashtra State Branch organized a National Conference on “Re-Visioning Pharmacy Education and Research: Contemporary Issues and Future Strategies” on 16th March, 2014 at Sri Siddhartha Pharmacy College, Nuzvid, Andhra Pradesh in collaboration with Krishna University, Machilipatnam. 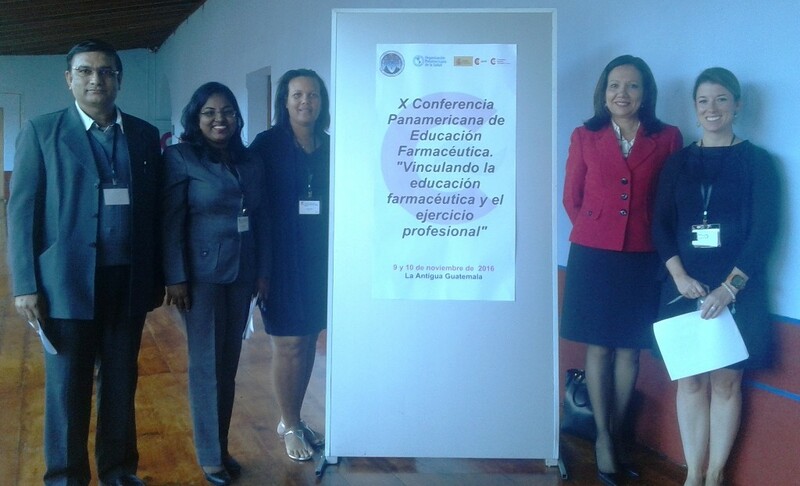 The main aim of this scientific conference was to provide a forum for in-depth and substantive discussion on the emerging technologies and methodologies being developed to overcome challenges that exist in all areas of Pharmaceutical Education and Research. 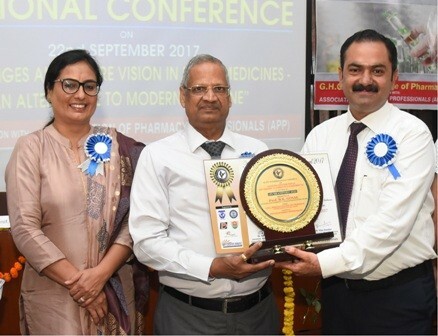 Conference was inaugurated by Dr. M. V. Basaveswara Rao, Dean, Faculty of Sciences, Krishna University, Machilipatnam, Andhra Pradesh as the Chief Guest; Dr. Rajiv Dahiya, President APP and Principal, Globus College of Pharmacy, Bhopal (MP) as Convener; Mohd. 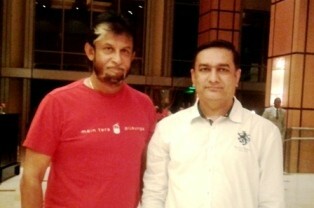 Rageeb Mohd. 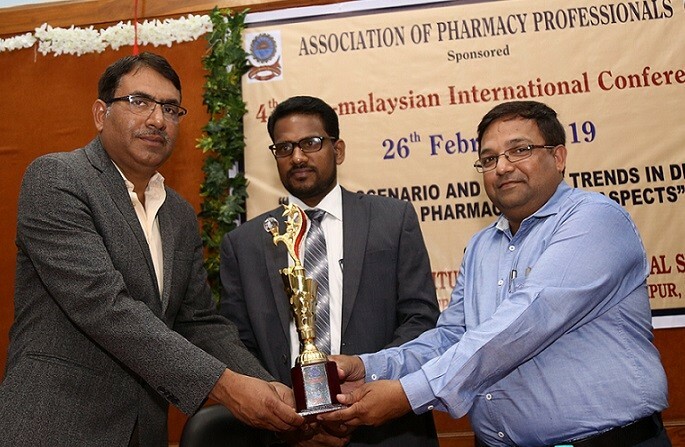 Usman, President, APP Maharashtra State Branch, Chopda (MS) as Co-convener; Dr. Srinath Nissankararao, Principal, Sri Siddhartha Pharmacy College, Nuzvid as Organizing Secretary and Dr. Sunita Dahiya, General Secretary APP as Chairman of the Scientific Committee. 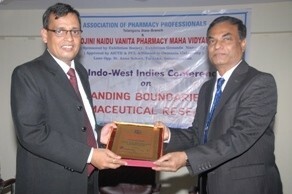 The scientific session of the conference was initiated with the inaugural lecture of Dr. Y. Rajendra Prasad, Professor, Department of Pharmaceutical Chemistry, University College of Pharmaceutical Sciences, Andhra University, Visakhapatnam (AP), followed by lecture of Dr. M. B. Viswanathan, an eminent professor from Centre for Research and Development of Siddha-Ayurveda Medicines, Bharathidasan University, Tiruchirappalli, Tamil Nadu. 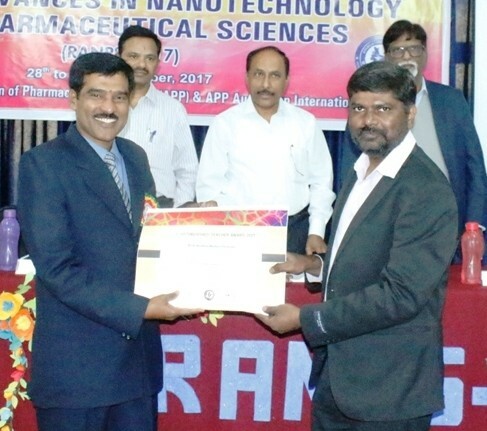 Another speaker, Dr. A. Muralidhar Rao, Principal and Professor, Maheshwara Institute of Pharmacy, Patancheru, Hyderabad (AP), addressed the audience on ‘Nanoscience’. 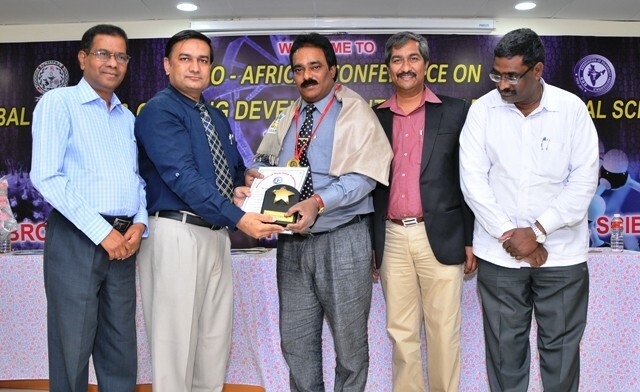 This scientific conference was witnessed by Dr. Suresh V. Chennupati (Sathupally, Khammam); Dr. A. Muralidhar Rao (Patancheru, Hyderabad); Dr. P. Narmada (Natco Research Centre, Hyderabad); Dr. G. Devala Rao (Vijayawada); Dr. P. Rambabu (Chebrolu, Guntur); Dr. P. Selvamani and Dr. S. Latha from Department of Pharmaceutical Technology, Anna University, Tiruchirappalli, Tamil Nadu as judges of scientific sessions, along with faculty and students from the pharmaceutical organizations like Acharya Nagarjuna University, Guntur; Sri Vani School of Pharmacy, Cheveturu; V. V. Institute of Pharmaceutical Sciences, Gudlavalleru etc. 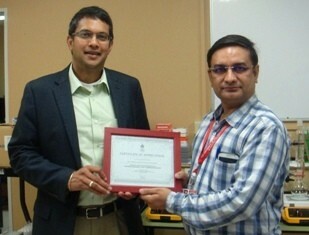 At the end, chairman of the hosting institute honored President APP with memento. 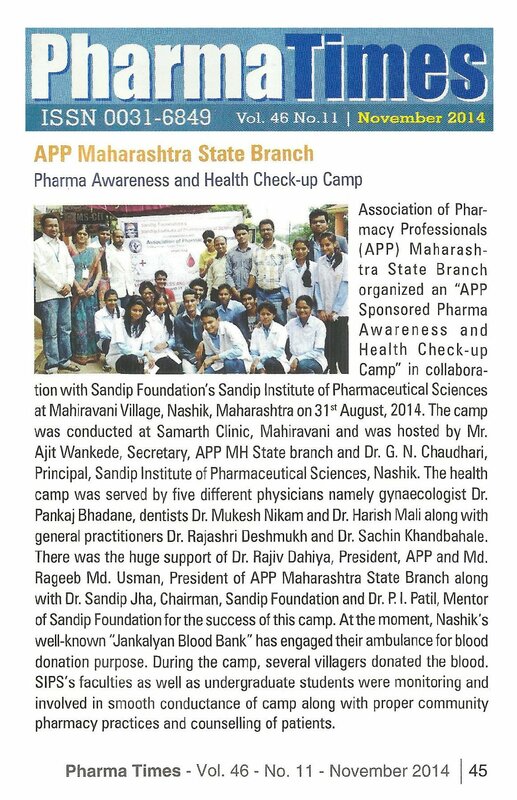 Association of Pharmacy Professionals (APP) Maharashtra State Branch organized a “APP Sponsored Pharma Awareness and Health Check-up Camp” in collaboration with Sandip Foundation’s Sandip Institute of Pharmaceutical Sciences at Mahiravani Village, Nashik, Maharashtra on 31st Aug, 2014. 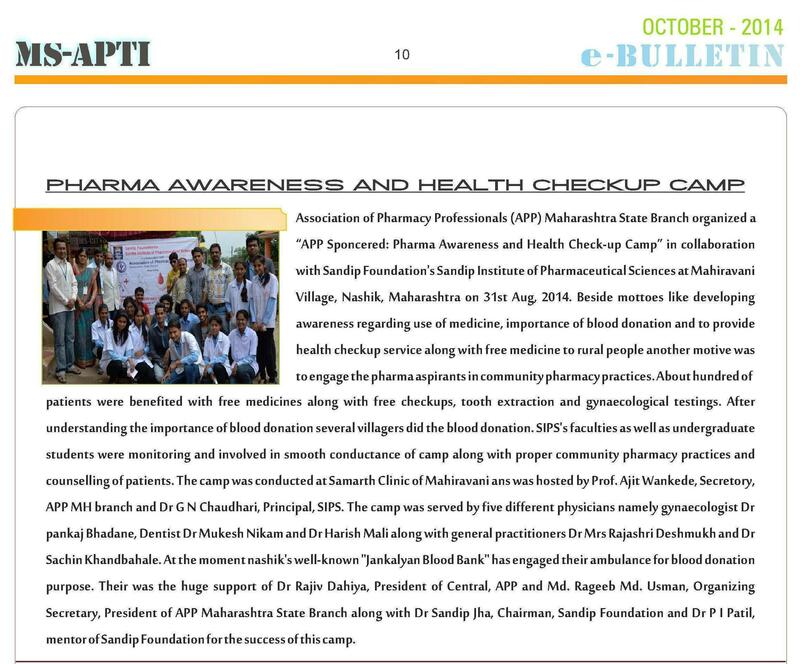 The camp was conducted at Samarth Clinic, Mahiravani and was hosted by Mr. Ajit Wankede, Secretary, APP MH State branch and Dr. G. N. Chaudhari, Principal, Sandip Institute of Pharmaceutical Sciences, Nashik. 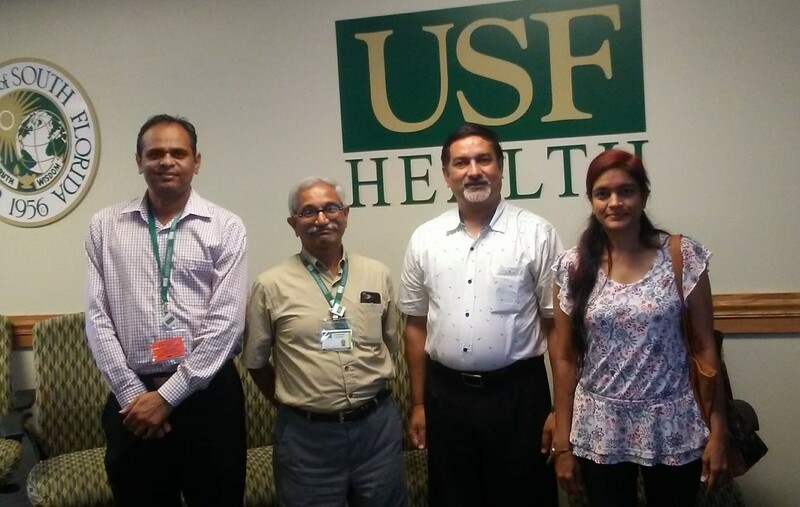 The health camp was served by five different physicians namely gynaecologist Dr. Pankaj Bhadane, dentists Dr. Mukesh Nikam and Dr. Harish Mali along with general practitioners Dr. Rajashri Deshmukh and Dr. Sachin Khandbahale. 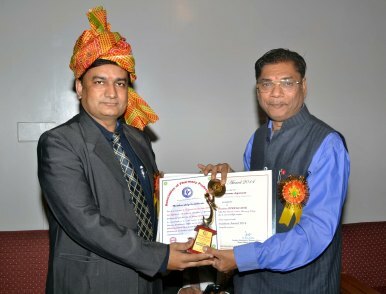 At the moment, Nashik’s well-known “Jankalyan Blood Bank” has engaged their ambulance for blood donation purpose.Beside motives like developing awareness regarding use of medicine, importance of blood donation and to provide health checkup service along with free medicine to rural people, another target was to engage the pharma aspirants in community pharmacy practices. About hundred of patients were benefited with free medicines along with free checkups, tooth extraction and gynaecological testings. 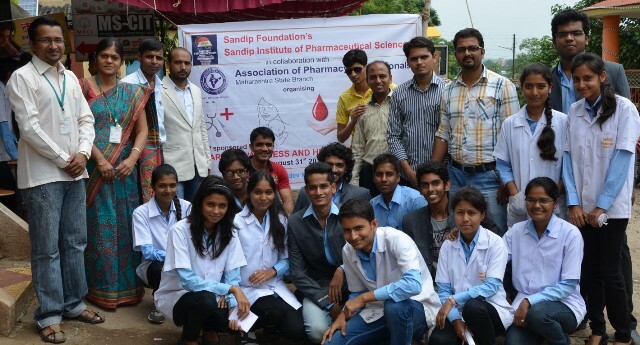 During the camp, several villagers donated the blood. 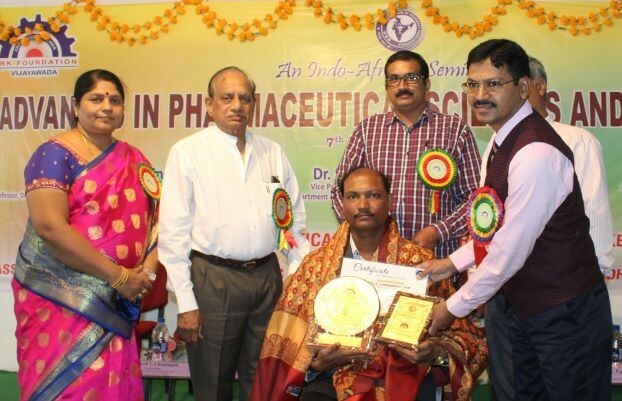 SIPS’s faculties as well as undergraduate students were monitoring and involved in smooth conductance of camp along with proper community pharmacy practices and counselling of patients. 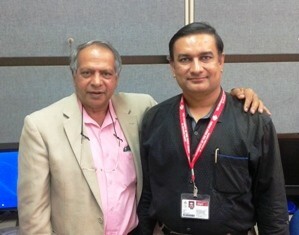 There was the huge support of Dr. Rajiv Dahiya, President APP and Md. Rageeb Md. 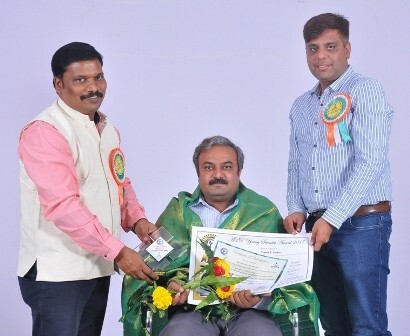 Usman, President of APP Maharashtra State Branch along with Dr. Sandip Jha, Chairman, Sandip Foundation and Dr. P. I. Patil, Mentor of Sandip Foundation for the success of this camp. 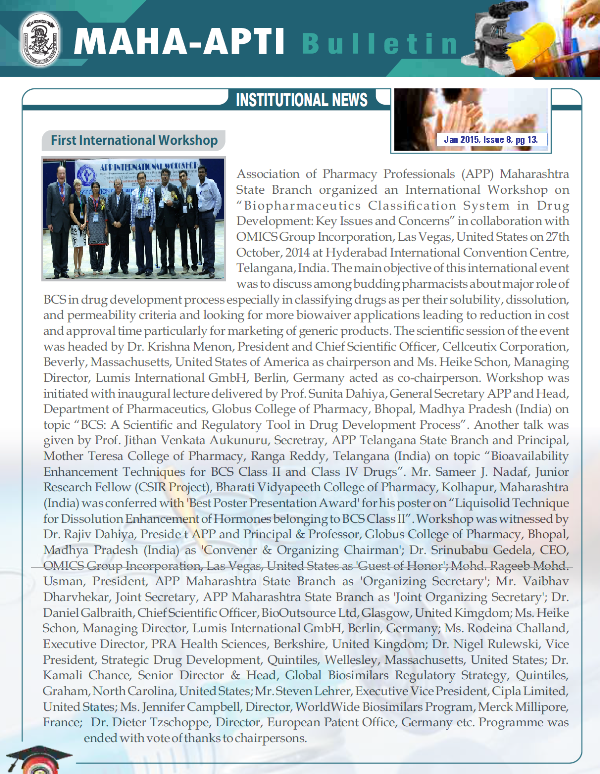 Association of Pharmacy Professionals (APP) Maharashtra State Branch organized an International Workshop on “Biopharmaceutics Classification System in Drug Development: Key Issues and Concerns” in collaboration with OMICS Group Incorporation, Las Vegas, United States on 27th October, 2014 at Hyderabad International Convention Centre, Telangana, India. 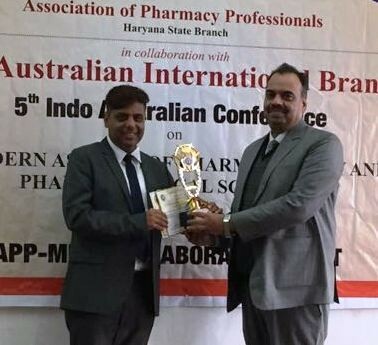 The main objective of this international event was to discuss among budding pharmacists about major role of BCS in drug development process especially in classifying drugs as per their solubility, dissolution and permeability criteria and looking for more biowaiver applications leading to reduction in cost and approval time particularly for marketing of generic products. 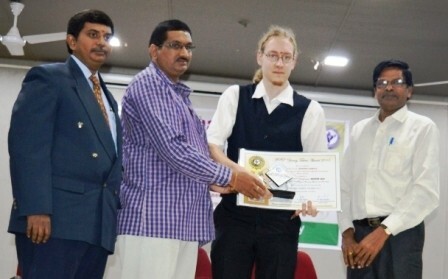 The scientific session of the event was headed by Dr. Krishna Menon, President and Chief Scientific Officer, Cellceutix Corporation, Beverly, Massachusetts, United States of America as chairperson and Ms. Heike Schon, Managing Director, Lumis International GmbH, Berlin, Germany acted as co-chairperson. 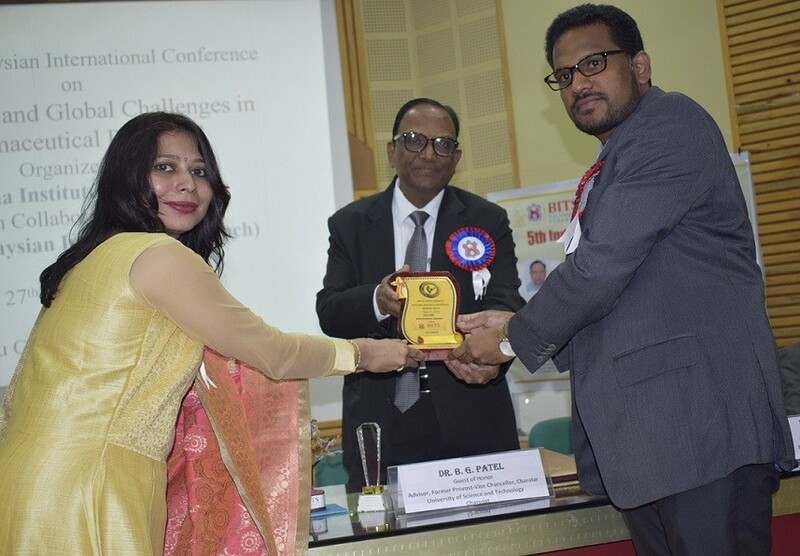 Workshop was initiated with inaugural lecture was delivered by Prof. Sunita Dahiya, General Secretary APP and Head, Department of Pharmaceutics, Globus College of Pharmacy, Bhopal, Madhya Pradesh (India) on topic “BCS: A Scientific and Regulatory Tool in Drug Development Process”. 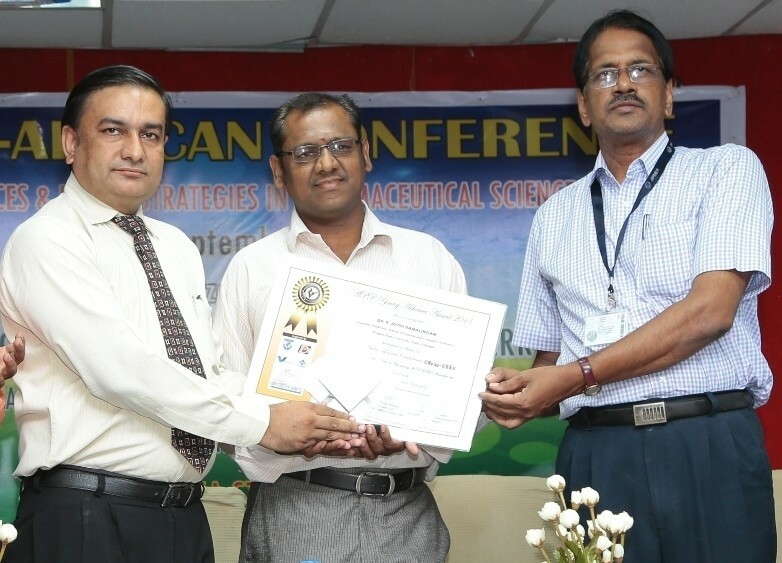 Another talk was given by Prof. Jithan Venkata Aukunuru, Secretray, APP Telangana State Branch and Principal, Mother Teresa College of Pharmacy, Ranga Reddy, Telangana (India) on topic “Bioavailability Enhancement Techniques for BCS Class II and Class IV Drugs”. 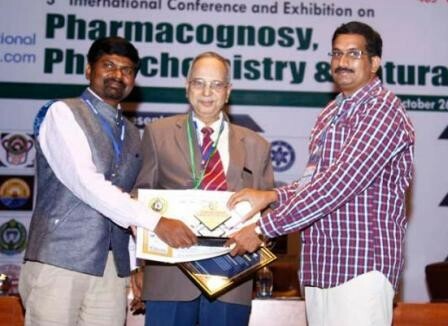 Mr. Sameer J. Nadaf, Junior Research Fellow (CSIR Project), Bharati Vidyapeeth College of Pharmacy, Kolhapur, Maharashtra (India) was conferred with ‘Best Poster Presentation Award’ for his poster on “Liquisolid Technique for Dissolution Enhancement of Hormones belonging to BCS Class II”. 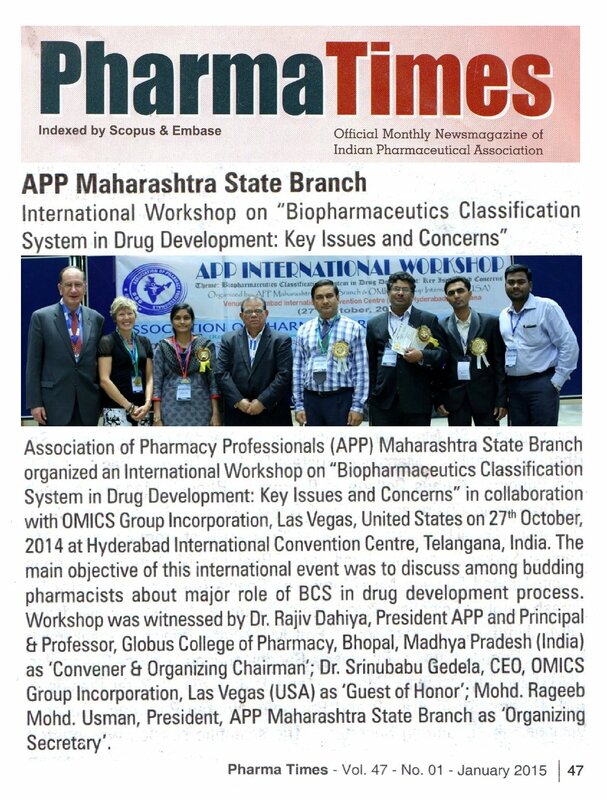 Workshop was witnessed by Dr. Rajiv Dahiya, President APP and Principal & Professor, Globus College of Pharmacy, Bhopal, Madhya Pradesh (India) as ‘Convener & Organizing Chairman’; Dr. Srinubabu Gedela, CEO, OMICS Group Incorporation, Las Vegas (USA) as ‘Guest of Honor’; Mohd. 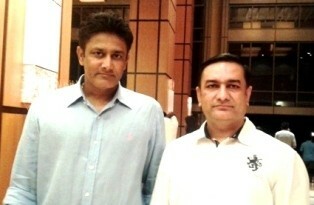 Rageeb Mohd. 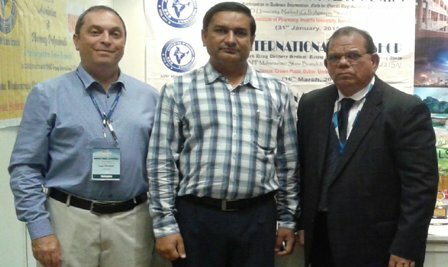 Usman, President, APP Maharashtra State Branch as ‘Organizing Secretary’; Mr. Vaibhav Dharvhekar, Joint Secretary, APP Maharashtra State Branch as ‘Joint Organizing Secretary’; Dr. Daniel Galbraith, Chief Scientific Officer, BioOutsource Ltd, Glasgow, United Kimgdom; Ms. Heike Schon, Managing Director, Lumis International GmbH, Berlin, Germany; Ms. Rodeina Challand, Executive Director, PRA Health Sciences, Berkshire, United Kingdom; Dr. Nigel Rulewski, Vice President, Strategic Drug Development, Quintiles, Wellesley, Massachusetts, United States; Dr. Kamali Chance, Senior Director & Head, Global Biosimilars Regulatory Strategy, Quintiles, Graham, North Carolina, United States; Mr. Steven Lehrer, Executive Vice President, Cipla Limited, United States; Ms. Jennifer Campbell, Director, WorldWide Biosimilars Program, Merck Millipore, France; Dr. Dieter Tzschoppe, Director, European Patent Office, Germany etc. 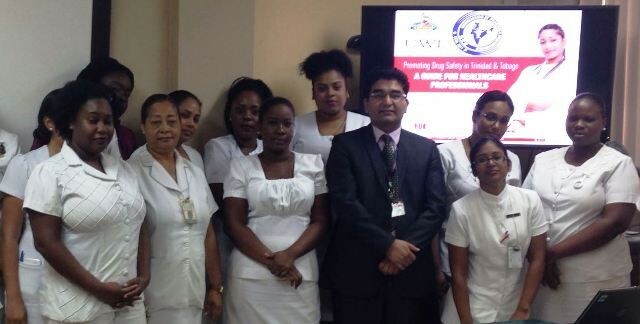 Programme was ended with vote of thanks to chairpersons. 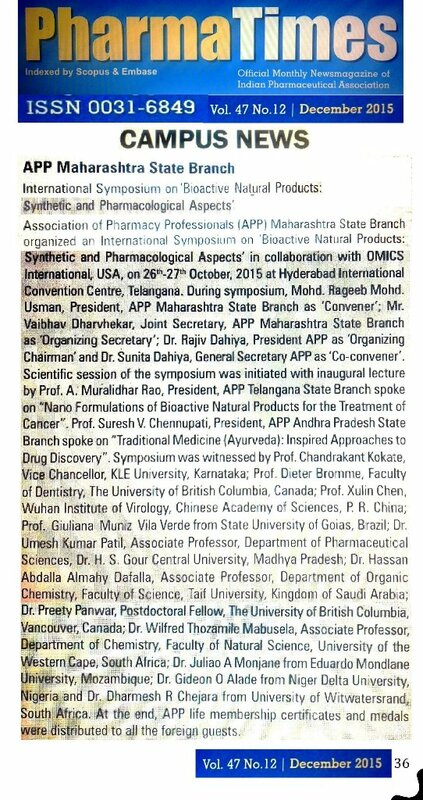 Association of Pharmacy Professionals (APP) Maharashtra State Branch organized an International Symposium on “Bioactive Natural Products: Synthetic and Pharmacological Aspects” in collaboration with OMICS Group International, United States on 26th-27th October, 2015 at Hyderabad International Convention Centre, Novotel & HICC Complex (Near Hitech City), Hyderabad, Telangana (India) during 405th OMICS scientific event 3rd International Conference and Exhibition on ‘Pharmacognosy, Phytochemistry & Natural Products’. 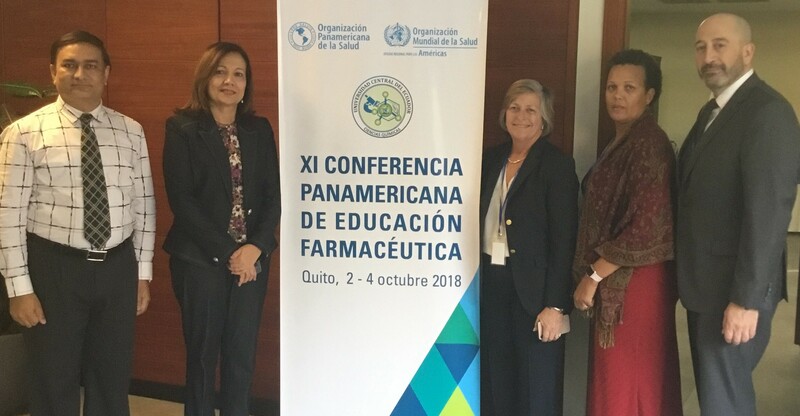 The main objective of this international symposium was to discuss among budding pharmacists about synthetic and biological potential of natural products. Mohd. 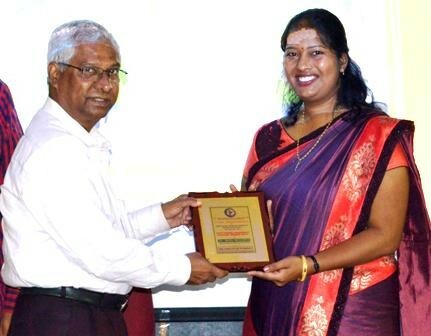 Rageeb Mohd. 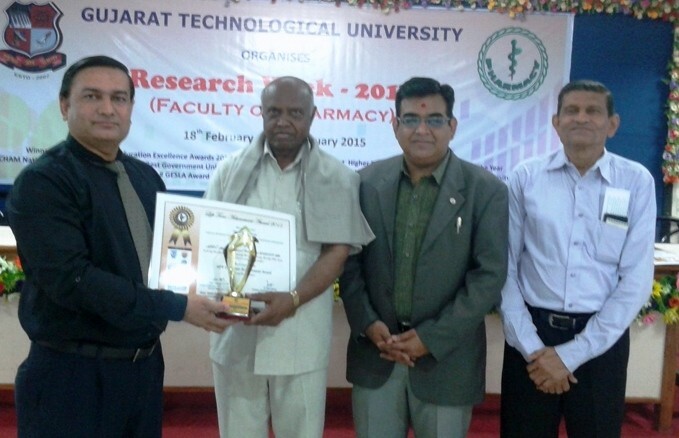 Usman, President, APP Maharashtra State Branch and Assistant Professor, Department of Pharmacognosy, Smt. 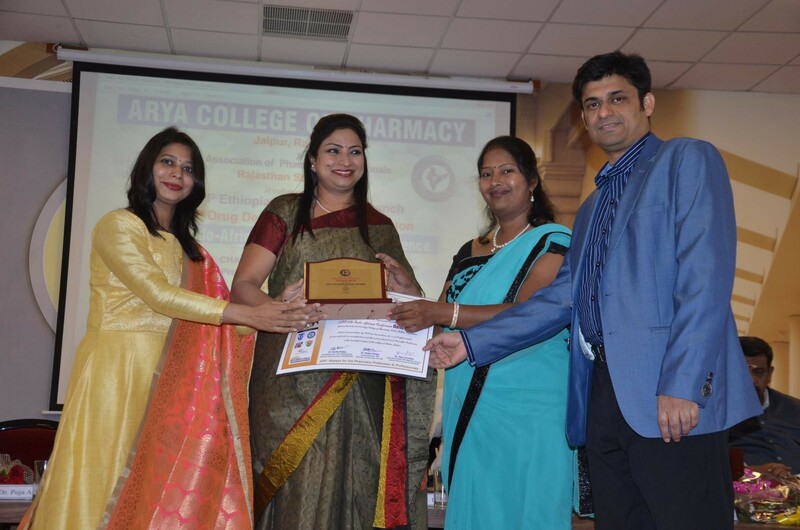 Sharadchandrika Suresh Patil College of Pharmacy, Chopda, Maharashtra (India) acted as ‘Convener‘ and Mr. Vaibhav Dharvhekar, Joint Secretary, APP Maharashtra State Branch and Asst. 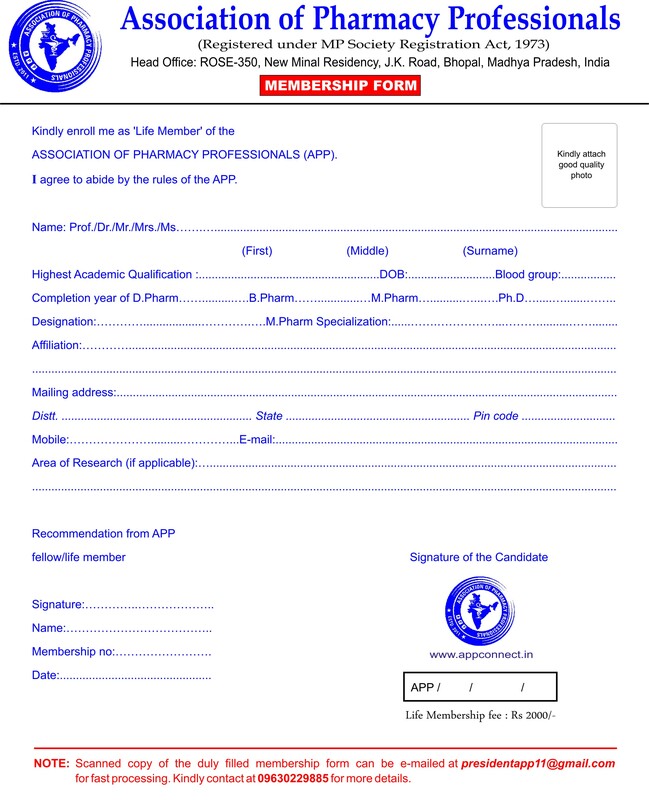 Professor, Department of Pharmacognosy, P. Wadhwani College of Pharmacy, Yavatmal (M.S.) 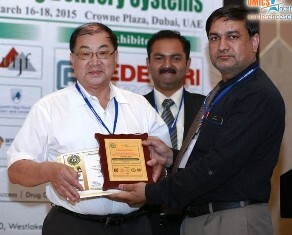 acted as ‘Organizing Secretary‘ for this international symposium. 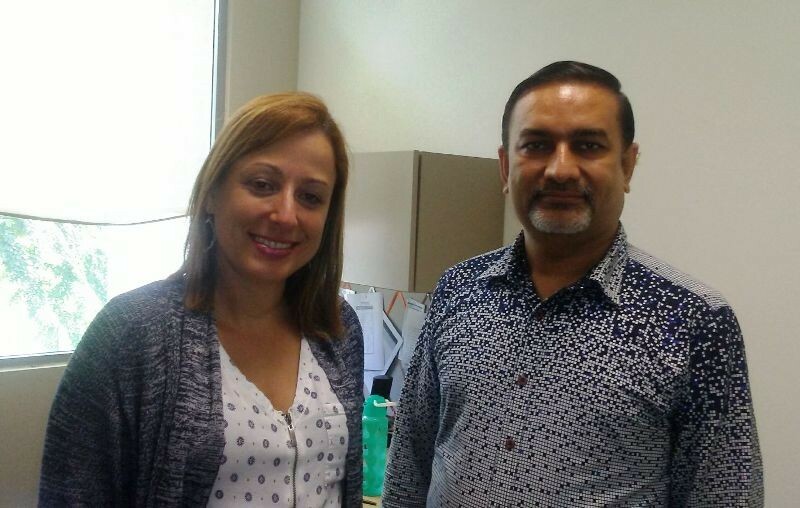 Dr. Rajiv Dahiya, President APP and Professor, Department of Pharmacy, College of Health Sciences, Mizan-Tepi University, Mizan, Ethiopia acted as ‘Organizing Chairman‘ and Dr. Sunita Dahiya, General Secretary APP and Professor, Department of Pharmacy, College of Health Sciences, Mizan-Tepi University, Mizan, Ethiopia acted as ‘Co-convener‘ in absentia. 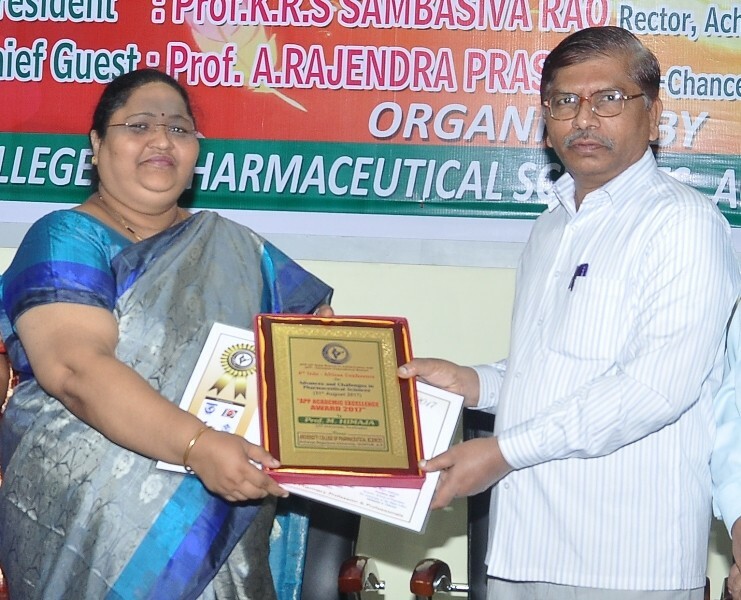 Symposium was initiated with inaugural lecture by Prof. A. Muralidhar Rao, President, APP Telangana State Branch and Principal, Maheshwara Institute of Pharmacy, Patancheru, Hyderabad, Telangana (India) on topic “Nano Formulations of Bioactive Natural Products for the Treatment of Cancer”. 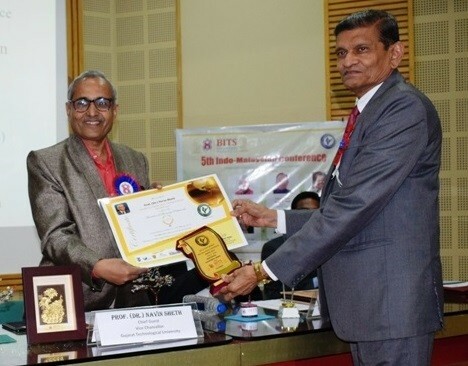 Dr. Rao, a recipient of Principal of the Year Award, Bharat Excellence Award, told that nanotechnology has the potential to give new breath of life to those bioactive natural products which were rejected due to poor solubility. 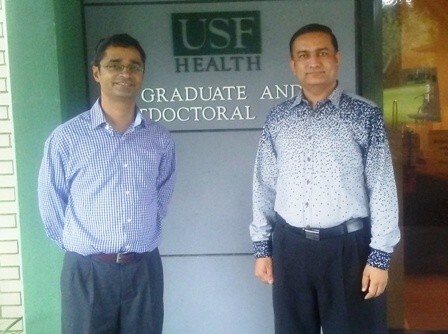 He also discussed that nanocrystal technology enables formulations to be developed without the need of toxic surfactants which may cause enhanced side effects or adverse reactions. 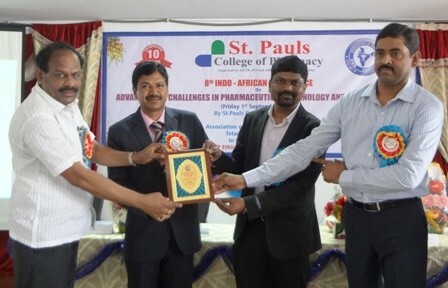 Another talk was given by Prof. Suresh V. Chennupati, President, APP Andhra Pradesh State Branch and Principal, Nova College of Pharmacy, Jangareddygudem, West Godavari, Andhra Pradesh (India) on topic “Traditional Medicine (Ayurveda): Inspired Approaches to Drug Discovery”. 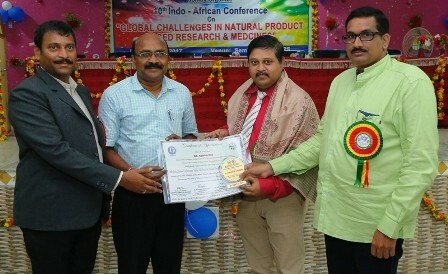 Dr. Chennupati, a recipient of Bharat Siksha Ratan Award, told that considerable research on Pharmacognosy, Photochemistry, Pharmacology and Clinical therapeutics has been carried out on ayurvedic medicinal plants and many pharmaceutical companies changed their strategies towards natural product drug discovery. 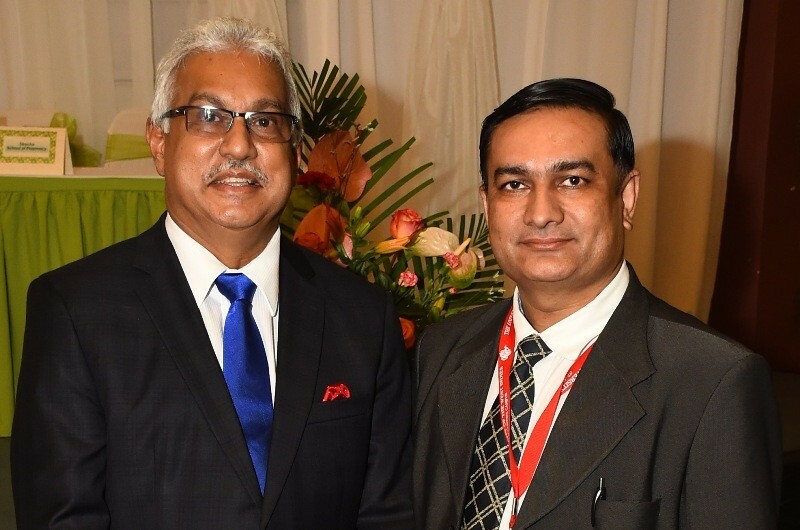 He emphasized on the fact that drug discovery strategies based on natural products and traditional medicines are the attractive options. 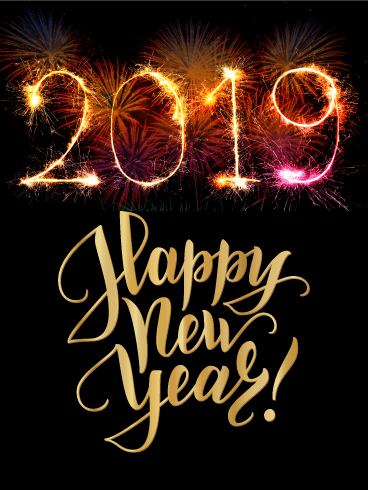 Traditional knowledge can offer smart strategy for new drug candidates to facilitate discovery process and also for the development of rational synergistic botanical formulations. 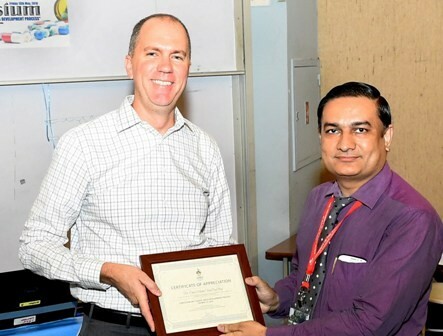 The scientific session of the event was headed by Prof. Chandrakant Kokate, Vice Chancellor, KLE University, Belgaum, Karnataka and Prof. Dieter Bromme, Faculty of Dentistry, The University of British Columbia, Vancouver, Canada. 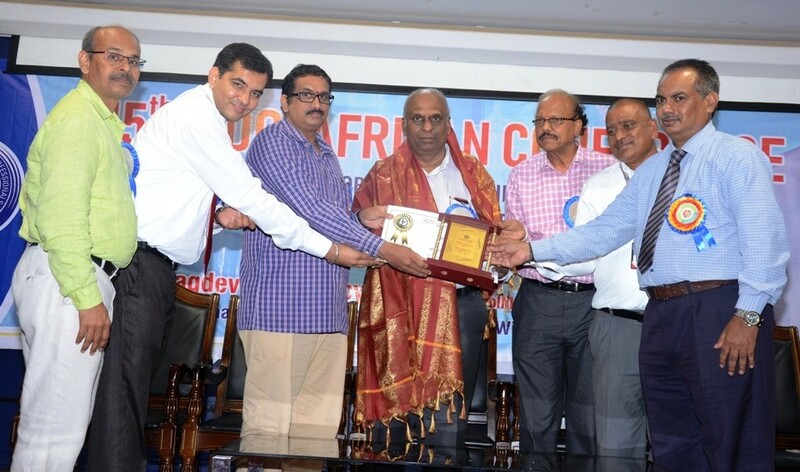 During valedictory function, Prof. Chandrakant Kokate, Vice Chancellor, KLE University, Belgaum, Karnataka was honored with ‘APP Life Time Achievement Award 2015‘ by Dr. A. Muralidhar Rao, President, APP Telangana State Branch, Hyderabad and Dr. Suresh V. Chennupati, President, APP Andhra Pradesh State Branch, Guntur. 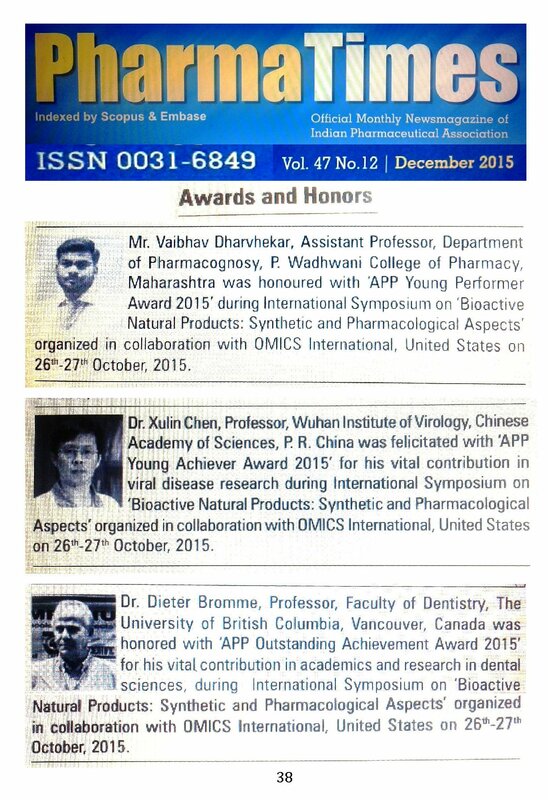 In addition, Prof. Dieter Bromme, Faculty of Dentistry, The University of British Columbia, Vancouver, Canada was conferred with ‘APP Outstanding Achievement Award 2015‘ by Dr. Umesh Kumar Patil, Associate Professor, Department of Pharmaceutical Sciences, Dr. H. S. Gour Central University, Sagar, Madhya Pradesh (India) andProf. 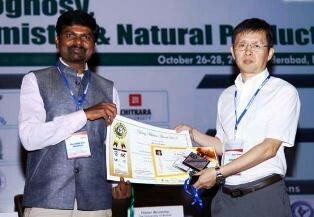 Xulin Chen, Wuhan Institute of Virology, Chinese Academy of Sciences, P. R. China was felicitated with ‘APP Young Achiever Award 2015‘ by Dr. A. Muralidhar Rao, President, APP Telangana State Branch. 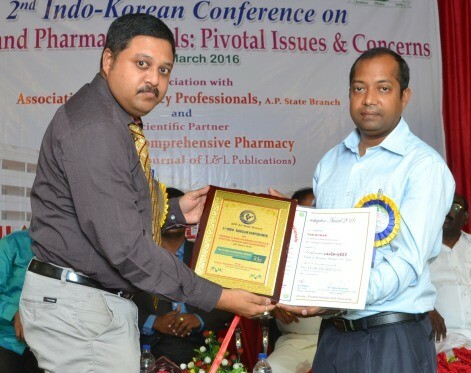 Further, Mr. Vaibhav Dharvhekar, Assistant Professor, Department of Pharmacognosy, P. Wadhwani College of Pharmacy, Yavatmal (M.S.) 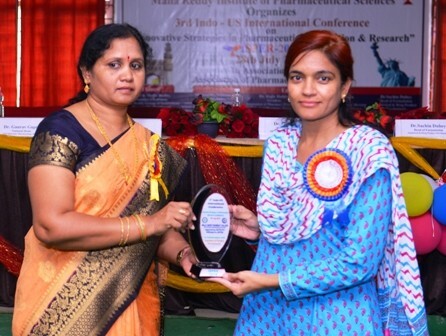 was honored with ‘APP Young Performer Award 2015‘ by Dr. Giuliana Muniz Vila Verde from Laboratory of Biodiversity, Sciences and Technology Unit, State University of Goias, Anapolis, Goias, Brazil. 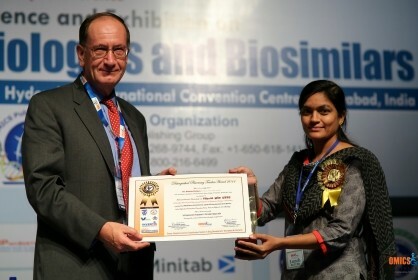 Moreover, Dr. Gilberto Lucio Benedito de Aquino from State University of Goias, Brazil won ‘Best Poster Presentation Award‘ for her presentation on ‘Application of microwave-assisted extraction to the fast extraction of plant phenolic compounds in Lafoensia pacari A.‘ during APP International Symposium. 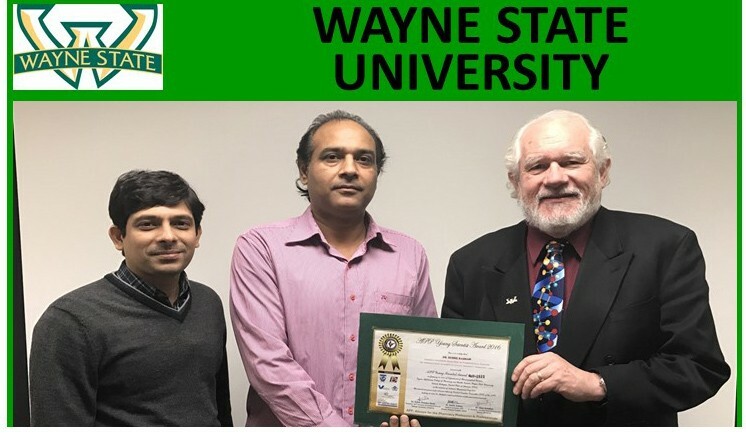 Symposium was witnessed by Prof. V. K. Dixit from Sagar, Madhya Pradesh, Dr. Srinubabu Gedela, CEO, OMICS International, United States of America; Dr. Hassan Abdalla Almahy Dafalla, Associate Professor, Department of Organic Chemistry, Faculty of Science, Taif University, Kingdom of Saudi Arabia; Dr. Preety Panwar, Postdoctoral Fellow, The University of British Columbia, Vancouver, Canada; Dr. Wilfred Thozamile Mabusela, Associate Professor, Faculty of Natural Science, University of the Western Cape, South Africa; Dr. Juliao A Monjane from Eduardo Mondlane University, Mozambique; Dr. Gideon O Alade from Niger Delta University, Nigeria and Dr. Dharmesh R Chejara from University of Witwatersrand, South Africa. 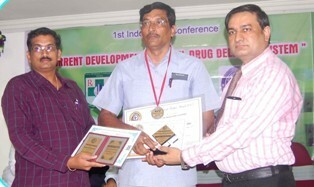 At the end, APP life membership certificates and medals were distributed to all the international speakers. 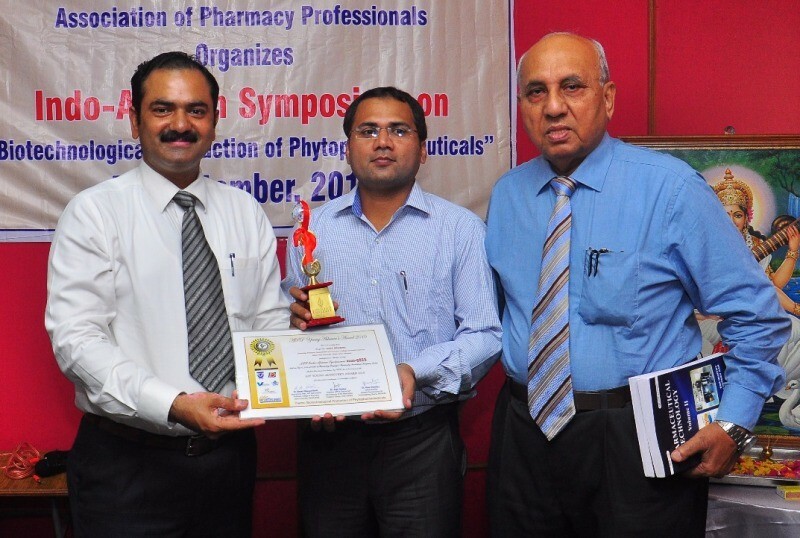 Association of Pharmacy Professionals (APP) Maharashtra State Branch organized a one-day National Conference on “Modern Trends in Pharmaceutical Drug Design and Related Medicinal Chemistry Aspects” on 3rd November 2017 at Shri Dhaneshwari Manav Vikas Mandal’s S.V.P. 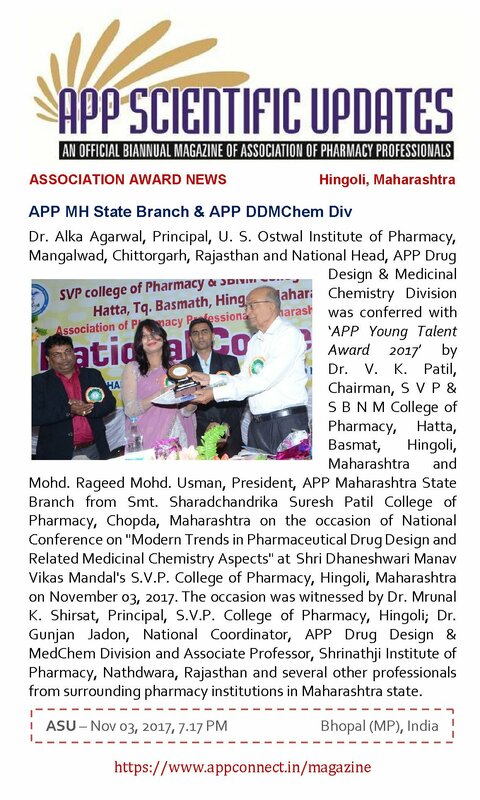 College of Pharmacy, Hingoli, Maharashtra, in collaboration with APP Drug Design and MedChem Division. 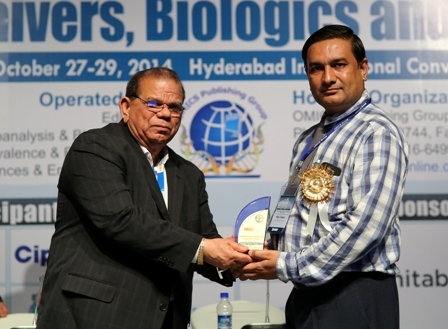 During this scientific conference, Dr. V. K. Patil, Chairman, S.V.P. 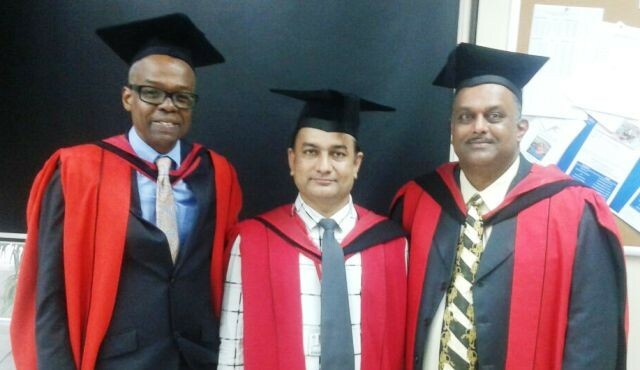 College of Pharmacy, Hatta, Basmat, Hingoli, Maharashtra acted as ‘Chief Patron’; Dr. Rajiv Dahiya, Founder President APP and Director, School of Pharmacy, Faculty of Medical Sciences, The University of the West Indies, St. Augustine, Trinidad & Tobago acted as ‘Convener’; Dr. Mrunal K. Shirsat, Principal, S.V.P. 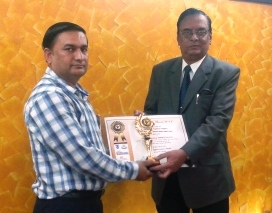 College of Pharmacy, Hingoli acted as ‘Organizing Secretary’; Mohd. Rageed Mohd. 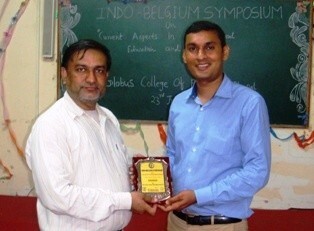 Usman, President, APP Maharashtra State Branch from Smt. 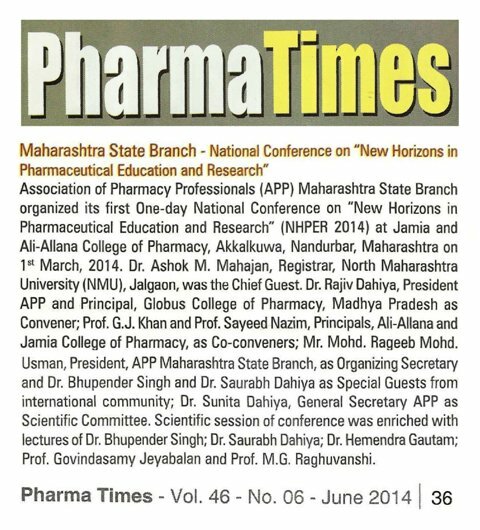 Sharadchandrika Suresh Patil College of Pharmacy, Chopda, Maharashtra acted as ‘Co-convener’; Dr. Sunita Dahiya, General Secretary APP and Professor Adjunct, School of Pharmacy, Department of Pharmaceutical Sciences, University of Puerto Rico, San Juan, Puerto Rico acted as ‘Scientific Committee Chairman’; Dr. Rita Mourya, Joint Secretray, APP Ethiopian International Branch from School of Pharmacy, College of Medicine and Health Sciences, University of Gondar, Gondar, Ethiopia acted as ‘Scientific Committee Co-chairman’ and Mrs. Attal V.R., Principal, S.B.N.M. 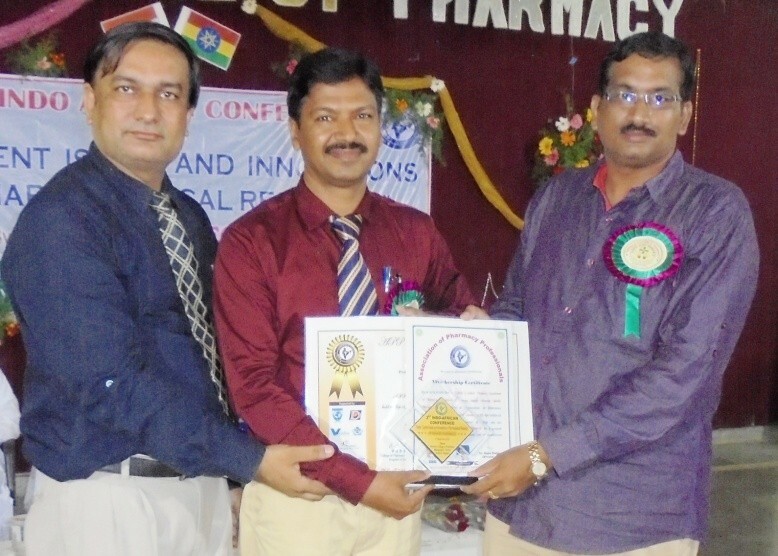 College of Pharmacy, Hingoli acted as ‘Chief Co-ordinator’. 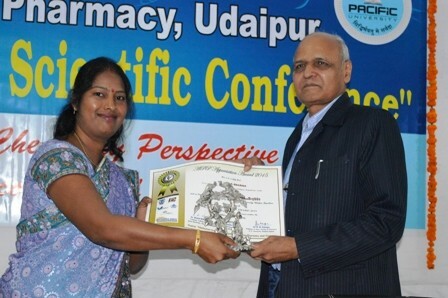 Scientific session of the conference was enriched with invited lectures of Dr. Alka Agarwal, National Head, APP Drug Design & MedChem Division and Principal, U. S. Ostwal Institute of Pharmacy, Mangalwad, Chittorgarh, Rajasthan and Dr. Gunjan Jadon, National Coordinator, APP Drug Design & MedChem Division and Associate Professor, Shrinathji Institute of Pharmacy, Nathdwara, Rajasthan on diverse topics of pharmaceutical interest like ‘CoMFA-3D QSAR Approch in Drug Design‘ and ‘Computer-Aided Drug Design: An Innovative Tool for Modelling‘. 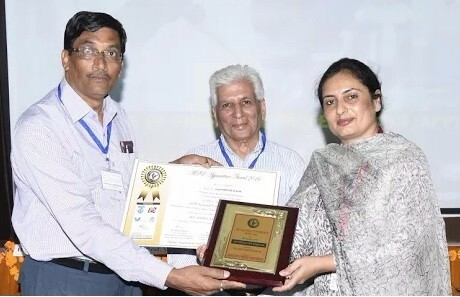 Dr. Alka Agarwal, Principal, U. S. Ostwal Institute of Pharmacy, Mangalwad, Chittorgarh, Rajasthan was conferred with ‘APP Young Talent Award 2017’ by President, APP Maharashtra State Branch and Chairman, S.V.P. 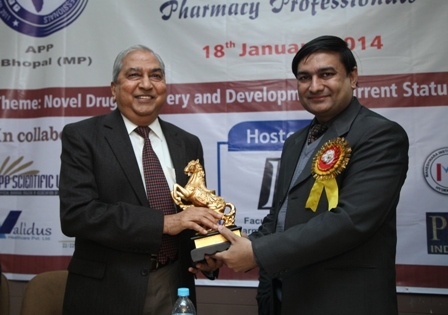 College of Pharmacy, Hatta, during the valedictory function. 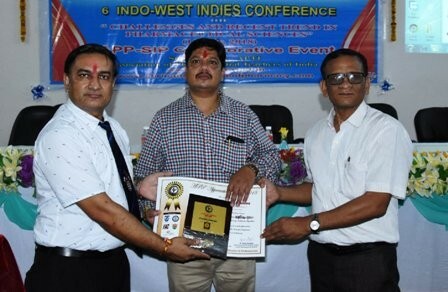 Also, appreciation awards were given to Principal and Chairman of the hosting institute. 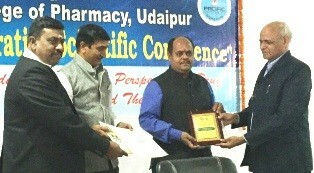 Conference ended with distribution of prizes to poster presentees and vote of thanks. 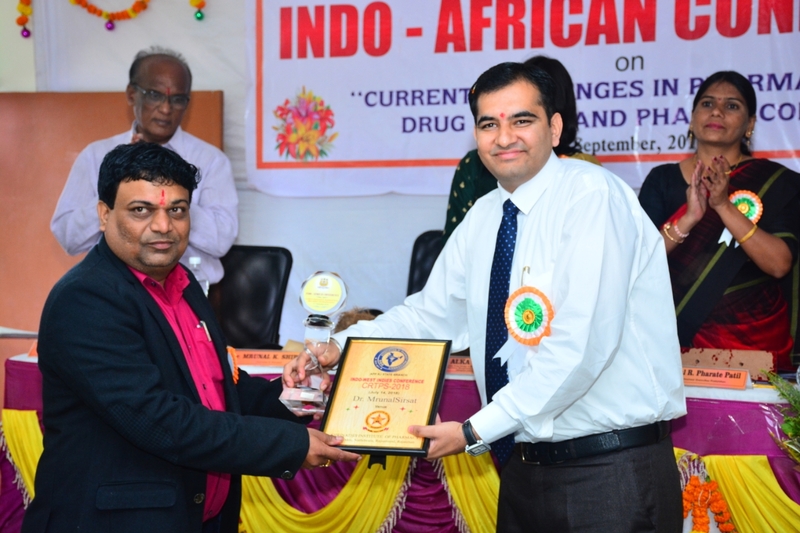 Association of Pharmacy Professionals (APP) Maharashtra State Branch organized 14th Indo African Conference on “Current Challenges in Pharmaceutical Drug Design & Pharmacology” at Loknete Shri Dadapatil Pharate (LSDP) College of Pharmacy, Mandvagan Pharata, Shirur, Pune, Maharashtra, India on 8th September 2018, in collaboration with APP Ethiopian International Branch and APP Drug Design & Medicinal Chemistry Division. 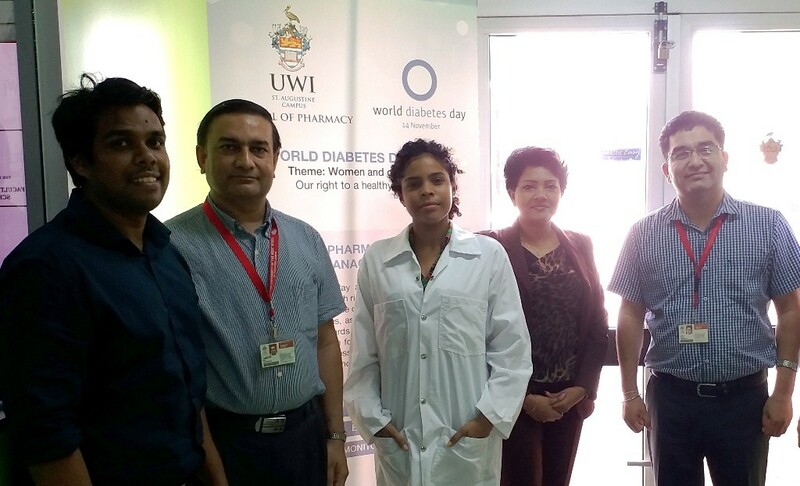 The scientific event was witnessed by Mr. Rajiv Pharate-Patil, President, Loknete Shri Dadapatil Pharate College of Pharmacy, Mandavgan Pharata as ‘Chief Patron’; Dr. Rajiv Dahiya, Founder President APP and Director, School of Pharmacy, Faculty of Medical Sciences, The University of the West Indies, St. Augustine, Trinidad & Tobago, West Indies as ‘Organizing Chairman’; Dr. Mrunal K. Shirsat, Principal & Professor, LSDP College of Pharmacy, Mandavgan Pharata as ‘Organizing Secretary’; Dr. Sunita Dahiya, General Secretary APP from Department of Pharmaceutical Sciences, School of Pharmacy, University of Puerto Rico, San Juan, Puerto Rico, United States of America as ‘Convener’ and Mohd. 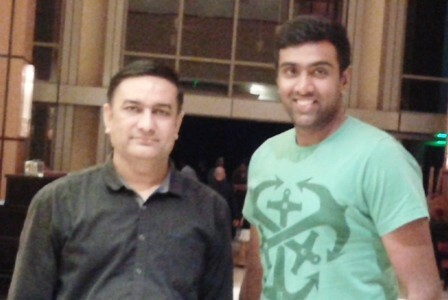 Rageeb Mohd. 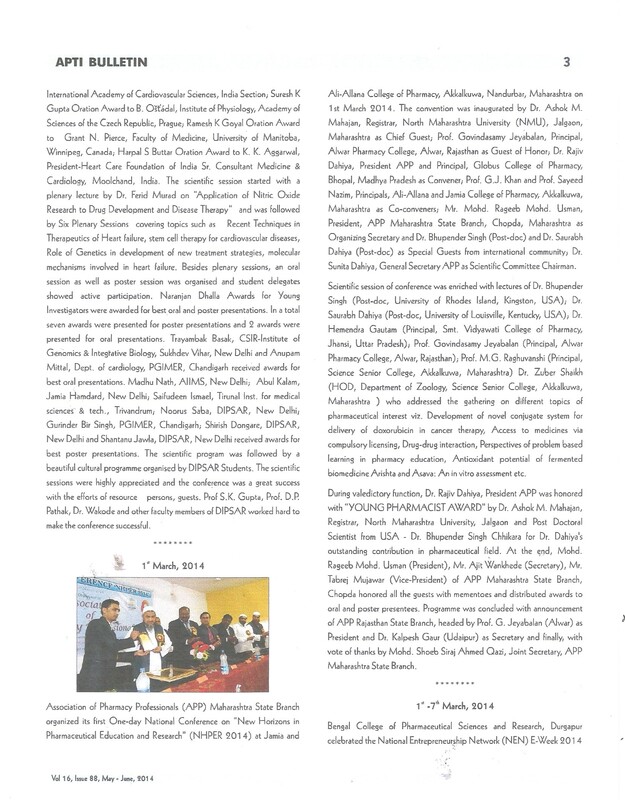 Usman, President, APP Maharashtra State Branch from Smt. 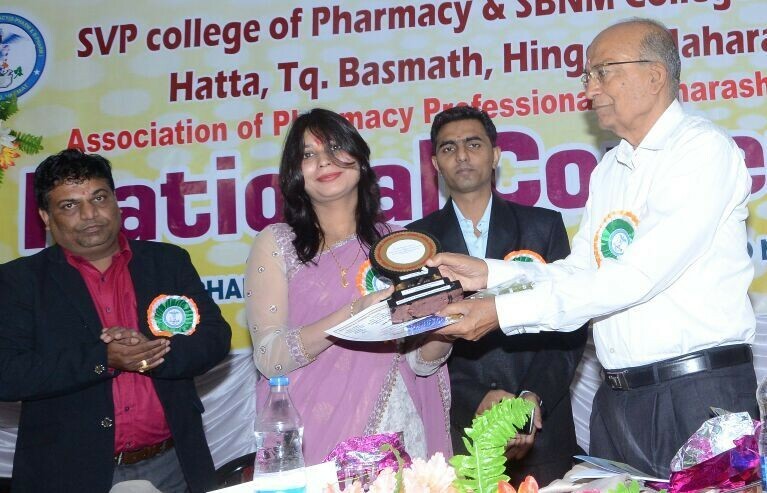 Sharadchandrika Suresh Patil College of Pharmacy, Chopda, Maharashtra as ‘Co-convener’. 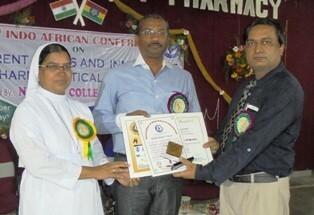 Scientific session was initiated with lecture of Dr. Digambar Balkrishna Ambikar from Department of Pharmacology, School of Pharmacy, College of Medical and Health Sciences, University of Gondar, Gondar, Federal Democratic Republic of Ethiopia who addressed the gathering on ‘Changing Trends in Preclinical and Clinical Pharmacology’. 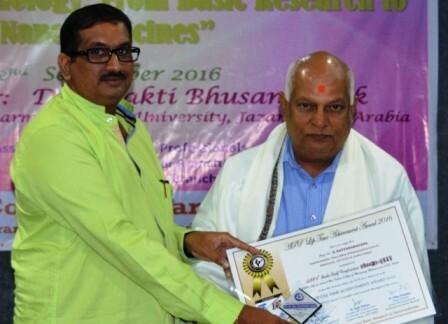 During his lecture, Dr. Digambar emphasized on the fact that the area of research and practice of pharmacology is expanded in all the preclinical and clinical departments with the molecular techniques to reveal the underneath truth of science. 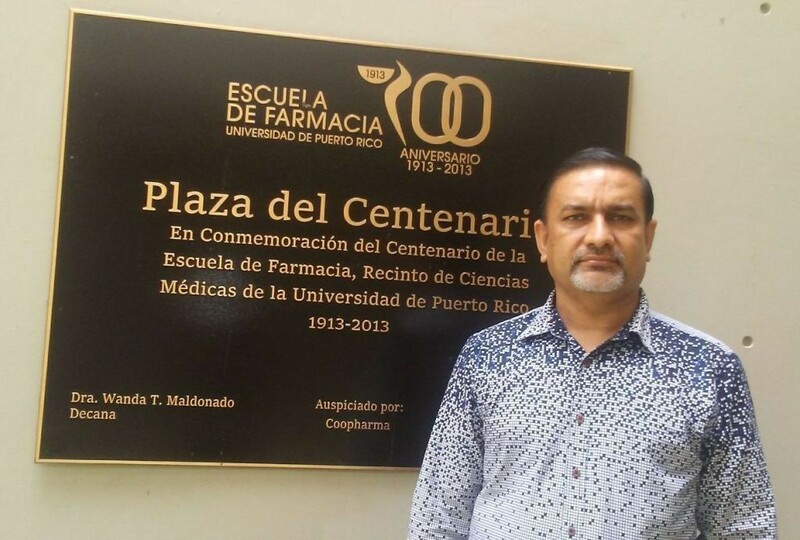 He told that, as a pharmacologist, there is variety of duties to perform in preclinical and clinical area which will lead to facilitation of molecular research as well as improving clinical aspect for a better patient care. 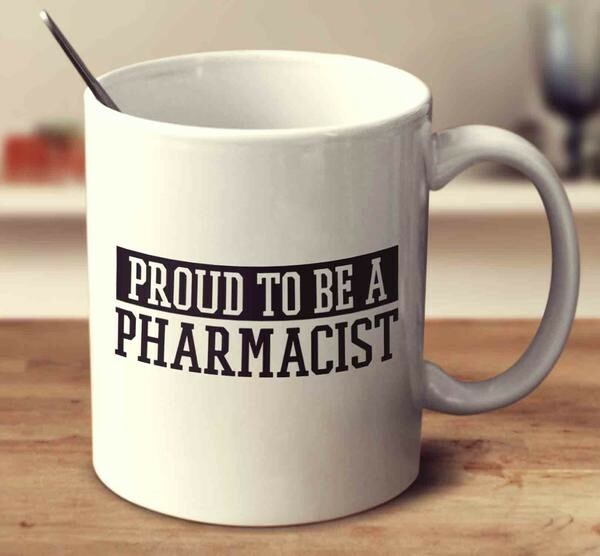 The pharmacologists have a wide role in research and development (R & D) from the target identification to lead findings to the preclinical research and play a major role in the critical path of R & D of the new chemical entities. 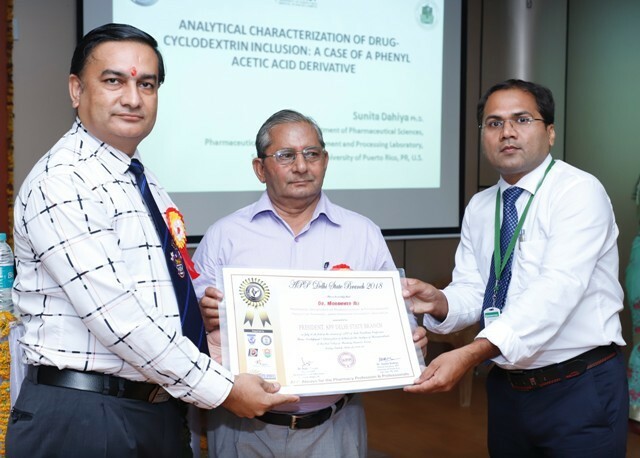 Other lectures were delivered by Prof. Alka Agarwal, National Head, APP Drug Design & MedChem Division and Principal, U.S. Ostwal Institute of Pharmacy, Mangalwad, Chittorgarh, Rajasthan and Dr. Gunjan Jadon, Joint Secretary, APP Rajasthan State Branch and Associate Professor, Shrinathji Institute of Pharmacy, Nathdwara, Rajsamand, Rajasthan on diverse topics of pharmaceutical interest. 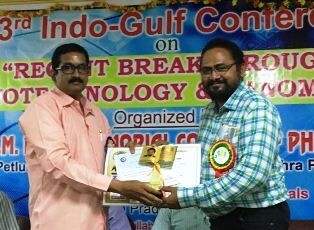 All the resource persons of the conference were felicitated with ‘APP Certificates of Appreciation’ after their lectures by the Organizing Secretary of the event. 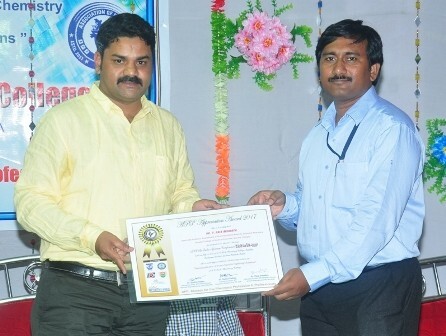 During the valedictory function, Mr. Rajiv Pharate-Patil, Shri Dhaneshwari Pharate Patil and Dr. Mrunal K. Shirsat from LSDP College of Pharmacy, Mandavgan Pharata were conferred with ‘APP Appreciation Awards’ by President, APP Maharashtra State Branch. 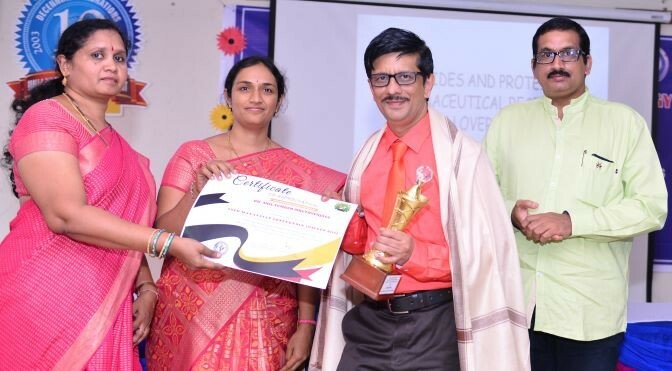 At the end, Ms. Priya Shete, B.Pharm student of LSDP College of Pharmacy, Mandavgan Pharata was conferred with ‘APP Best Student Award’; Mr. Vivek Mahavir Satpute, Assistant Professor, Department of Quality Assurance, LSDP College of Pharmacy, Mandavgan Pharata with ‘APP Best Achiever Award’ for his outstanding academic and research output; Mr. Avinash Dhobale, Assistant Professor, Department of Pharmaceutics, LSDP College of Pharmacy, Mandavgan Pharata with ‘APP Best Researcher Award’ for his outstanding research performance and Mr. Rakesh Machhindra Wani, Assistant Professor, Department of Quality Assurance, LSDP College of Pharmacy, Mandavgan Pharata with ‘APP Best Teacher Award’ for his outstanding teaching performance. 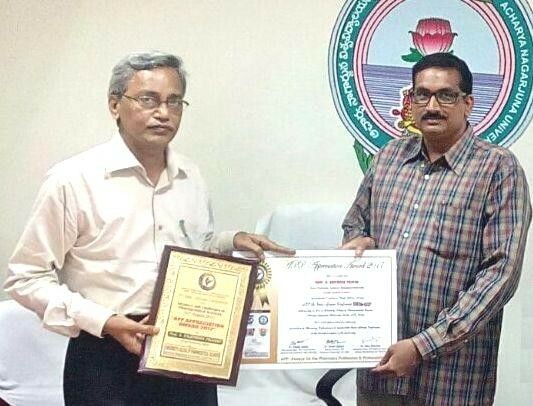 Programme ended with vote of thanks, distribution of best poster certificates and nomination of Dr. Mrunal K. Shirsat, Principal & Professor, LSDP College of Pharmacy, Mandavgan Pharata with ‘Vice President’ of the APP Maharashtra State Branch for 2018-19.